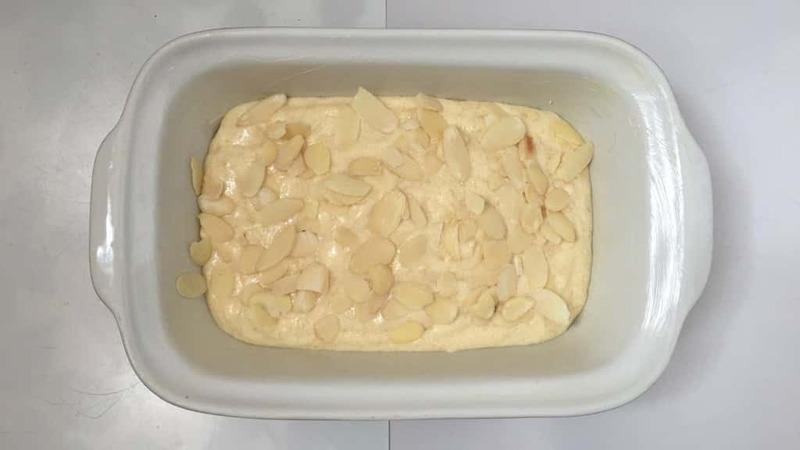 Almond Cake Recipe with Yogurt & Honey | Simple. Tasty. Good. Here’s how this almond cake recipe was born. 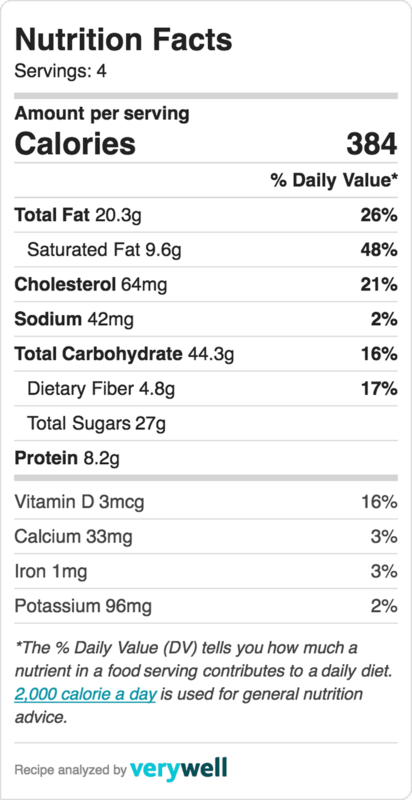 I got this unopened container of yogurt (after making my fried eggplants in yogurt sauce) that slowly comes close to its expiring date… I could just chuck it in a bowl and add some fruits and stuff for breakfast or as an afternoon snack. But because I got this friend coming over for a cup of coffee this afternoon, I think I should perhaps make a treat with that yogurt. How about a yogurt cake! Looking for the KitchenAid Cook Processor recipe? Then scroll down to the second recipe on this Love cooking with almonds? Then check out my Spanish meatballs in a creamy almond and saffron sauce! 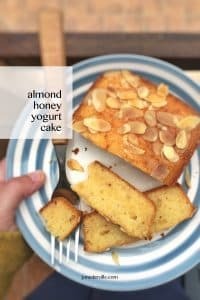 A surprising treat with yogurt and honey: this almond cake recipe is the perfect bite for your afternoon cup of tea or coffee! 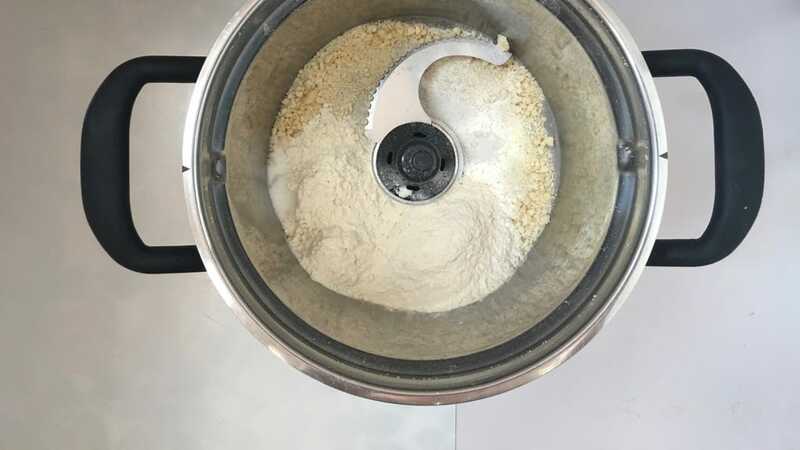 Add the dry ingredients to a large mixing bowl: the caster sugar, the self-raising flour, the almond meal and a pinch of salt. Stir well. Then add the soft butter, the egg, the lemon juice and the yogurt. Stir the cake batter well for about 30 seconds. Don’t stir the batter for too long or you will beat the air out of the eg whites. Then add the honey to the batter as well. Give the batter a quick last stir and then scoop the cake batter in a small buttered cake tin or dish. Sprinkle with the shaved almonds. Bake the cake in a preheated oven at 356°F (180°C) for 30 minutes. Remove the baked cake from the oven and let it cool down fully. Then slice the cake up and serve with an extra dollop of yogurt and some honey. 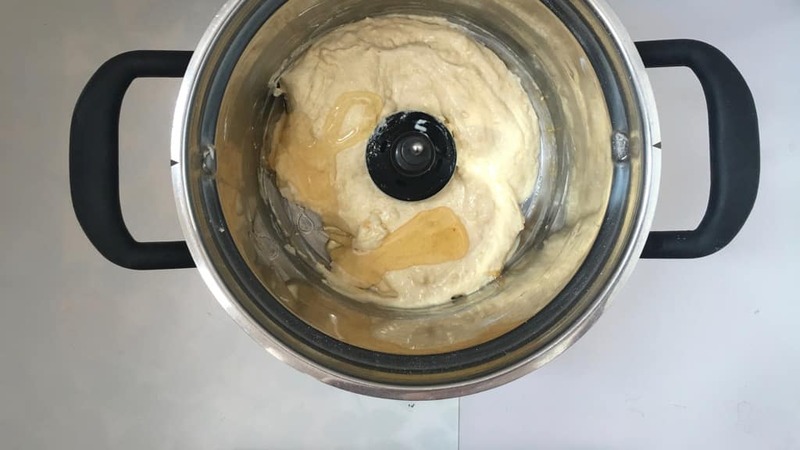 Did you know that the KitchenAid Cook Processor is a great tool to make cake batters? Because you don’t have any messy countertops or a stack of sticky bowls to clean afterwards. I loved the fact that I could also blend the peeled almonds using the powerful MultiBlade for this almond cake. 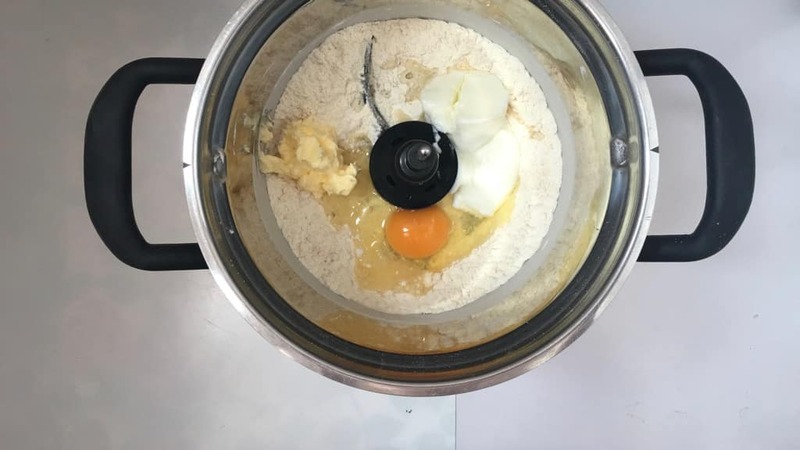 Once you add all the wet ingredients and then let the Cook Processor do its job, the batter is stirred at a constant pace and reduces the risk of beating all the air out of the egg white, which is also responsible for the cake to become airy and fluffy. One minute is really enough here. Another cake batter that turned out just perfect! Also check my kiwi fruit cake I made! Add the peeled almonds to the bowl of the Cook Processor fitted with the MultiBlade. Close the lid and press Pulse for 30 seconds until the almonds are quite fine. Remove the MultiBlade and replace it by the StirAssist. Then add the dry ingredients: the caster sugar, the self-raising flour and a pinch of salt. Close the bowl and press Quick Stir for 10 seconds. Then add the soft butter, the egg, the lemon juice and the yogurt. Close the bowl and set the time at 1 minute. Press Start and adjust the speed to 3. Then add the honey to the batter. Close the bowl and press Quick Stir for 10 more seconds. Scoop the cake batter in a small buttered cake tin or dish. Sprinkle with the shaved almonds. Bake the cake in a preheated oven at 356°F (180°C) for 30 minutes. Then remove the baked cake from the oven and let it cool down fully. Slice the cake up and serve with an extra dollop of yogurt and some honey.